Open your ears to the music of the universe as the world’s greatest orchestra of teenagers embarks on a voyage back through a century of space discovery. astronomy. Fasten your seat belts and prepare for a thrilling ride to new musical frontiers as the original sound of the gravitational wave echoes through the orchestra and individual players gradually become one united force. Next are two of classical music’s must-hear pieces: Strauss’s Also sprach Zarathustra, with its glorious, spine-tingling opening fanfare made famous by Stanley Kubrick’s film 2001: A Space Odyssey, and Holst’s The Planets completed by Colin Matthews’ Pluto:The Renewer. This music never fails to stir the emotions with its huge melodies and luscious harmonies and in the hands of these young musicians, it will fizz with an explosive, barely containable energy. The countdown is on - join us for a fearless, totally teenage cosmic adventure. We headed to space and beyond at the BBC Proms. Read our reviews and watch our short videos. Millie Ashton, NYO Leader, uncovers the story behind our new musical work that transforms a chirp from a galaxy far away into an imaginative orchestral piece. Please book here for a free place. ​today. This interactive concert will be an immersive journey that creatively explores the space of the Southbank Centre and takes you beyond the earth’s horizon to otherworldly dimensions of sound and time. We take over the streets of Birmingham with pop-up performances in various nooks and crannies of the city. Taking centre stage will be an astronomical performance of extracts from Holst's spine-tingling work The Planets, played by an epic ensemble of 75 NYO Musicians at Millennium Point & Thinktank, Birmingham Science Museum (3.30pm). Get ready to shatter the earth's horizon and venture into outer space with NYO. How does the universe sound? And how is the individual human being confronted with the infinity of time and space which is beyond imagination? When NYO asked me to write a companion piece to Strauss’ Also sprach Zarathustra and Holst’s The Planets, I felt that this piece should deal with these questions. In September 2015, gravitational waves were detected by both of the twin Laser Interferometer Gravitational-Wave Observatory (LIGO) detectors, located in Livingston, Louisiana, and Hanford, Washington, USA. The phenomenon detected was the collision of two black holes. Using the world’s most sophisticated detector, the scientists listened for a split second as the two giant black holes, one 35 times the mass of the sun, the other slightly smaller, circled around each other. Of course the black holes were orbiting for much longer, probably millions of years, but we couldn’t hear them until the very last 200 thousandths of a second of the event. Before that, they were too low in frequency for the LIGO detectors. Based on the observed signals, LIGO scientists estimate that the black holes for this event were about 29 and 36 times the mass of the sun, and the event took place 1.3 billion years ago. The gravitational waves were predicted by Einstein’s General Theory of Relativity a hundred years ago, but only now has this theory been confirmed. We can hear a sound of the universe that goes back to an absolutely unthinkable past. The LIGO Scientific Collaboration (LSC) is a team of scientists and collaborators out of 80 nations worldwide. This discovery was an international collaboration of highly professional individuals who gave their best for a team result. 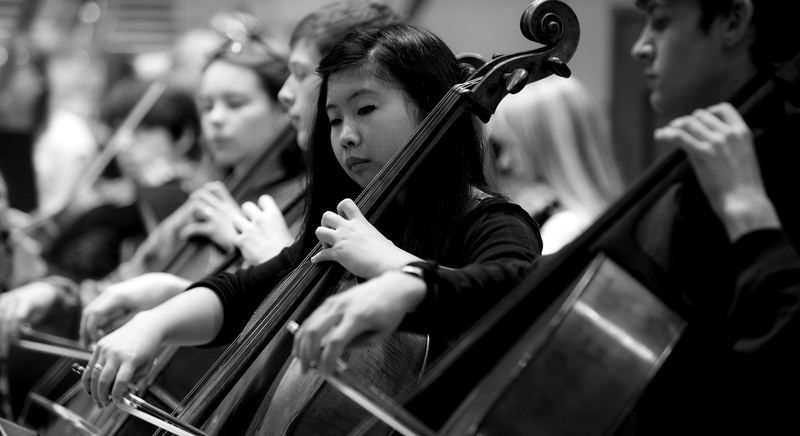 So only if we combine our energy, we get the best results – which does surely apply to a youth orchestra as well and especially such a fantastic team as the National Youth Orchestra of Great Britain. This is why I am also happy to use almost all musicians from the NYO. The simultaneity of past and future: Astrophysicists and astronomers are the archaeologists of the past and yet they are researching for the future of mankind. This composition which was developed in collaboration with the composer Uroš Rojko uses the original chirp sound from the LIGO Scientific Collaboration which is not only heard through a sampler but also reflected through the sound from the orchestral players in different ways. I was fascinated by the idea that the universe is a gigantic, never-ending cosmos of sounds – not in spherical harmonies like the philosophers and musicians of the ancient world and Renaissance thought but like a somewhat chaotic sound. When Stanley Kubrick’s 2001: A Space Odyssey premiered in 1968, it wasn’t the cast who went on to achieve stardom: it was the first two minutes of Strauss’ tone poem which opened the film and was then heard everywhere – topping the charts in a disco makeover, heralding Elvis’ arrival onstage in his final concerts, and transmitted on TV when mankind landed on the moon. If you needed proof of classical music’s enduring power, this is it: called upon time and again as little written since can compare. Meant to depict sunrise, the iconic trumpet fanfare and blazing C major organ chord arising from a primordial ooze of strings, sound more like we are witnessing the birth of music itself. Yet, for all its familiarity, most people have never heard the thirty further minutes of music that follow it. Zarathustra remains one of the best and least known pieces ever written. How come? Perhaps it’s the baffling title. Even in translation – ‘Thus spake Zarathustra’ – it makes little sense. Strauss’ headings for its nine interflowing ‘chapters’ only confuse us further: Introduction, or Sunrise; Of Those in Backwaters; Of the Great Longing; Of Joys and Passions; The Song of the Grave; Of Science and Learning; The Convalescent; The Dance Song; The Song of the Night Wanderer. Given this insight, you might regard the cataclysmic opening as the dawn of man, biblical or otherwise. In its wake, the orchestra shudders tentatively then solo strings take their first baby steps, rising like saplings, growing in number and gathering conviction from each other. It’s like watching a flower open in slow motion. They look forward optimistically, just as the solo strings of Metamorphosen at the very end of Strauss’ life looked back wistfully. gradually surging into a sea of emotions – the ‘longing, joys and passions’ of Strauss’ chapter headings. Such ecstasy eventually implodes, leaving the orchestra wary and exposed. A solo violin – so assertive in other Strauss works like Heldenleben – here seems to weep. Strauss called this the ‘Grave Song’, the music meekly asking what hope there is in the face of death. The answer emerges from the obscurity: an angular melody whispered at first by cellos and basses then restated with growing confidence in fugal entries across the orchestra. Systematically utilising all twelve notes of the chromatic scale, this theme is Strauss’ depiction of technological advance: mankind’s weapon against mortality. From it, fresh fulfilment erupts: flutes and violins leap airborne, suddenly exultant. Above shimmering strings, the woodwind emit a restless figure almost identical to that which John Williams assigned Superman in the classic 1980s movies. Unquestionably, this is Strauss’ super human awoken too, hubristically gathering strength, only to be cut short by a stark reiteration of the opening chords – momentarily silenced by its maker. While Strauss labelled this sequence ‘The Convalescent’, the music shows no sign of retiring. Brazen trumpet fanfares are parroted across the orchestra, as if the instruments were goading each another not to quit, and duly Superman returns on a torrent of sonic effervescence, tingling with a truly hyperactive triangle. The solo violin finds its lost voice and leads the orchestra in a celebratory waltz: even super humans like to party. Then with clanging bells, like those which smash Cinderella’s dream at midnight, the rapture collapses. As the music dwindles, the solo violin finds a companion: perhaps Strauss is saying, at the end of the day, it’s not about putting your faith in gods or yourself, but in each other. Even still, the radiant B major sunset into which these two companions drift is quietly contended by the very opening notes of the piece plucked by the lowest strings, steadfastly yet in C major. What it signifies, you decide. While Nietzsche’s words insisted you see the world as he did, you can read what you want in Strauss’ music. Long before Strauss set pen to paper, music lover Nietzsche prophetically declared that his book ‘really belongs among the symphonies’. Strauss’ original subtitle for the piece was the rather splendid ‘Symphonic Optimism in fin-de-siècle form, dedicated to the 20th century’. At a Budapest performance in 1904, one young concertgoer recalled being ‘aroused by a flash of lightning… the work stimulated the greatest enthusiasm in me… I threw myself into a study of Strauss’ scores, and began to compose’. That individual was Bartók. Now for a space odyssey of a different kind. Long before Sputnik or NASA, Holst cast his imagination to the far side of the solar system, embarking on a piece of music that would depict the planets. The seed was sown when his friend Clifford Bax (brother of the composer Arnold) introduced Holst to astrology. The seven movements – each representing a different planet – aren’t entirely in geographical order (where Mercury and Venus would come first). This is a useful reminder that Holst set out to capture their astrological personalities rather than their physical attributes – when we get there, don’t look for Saturn’s rings! Instead, the sequence is shaped by contrasts in character, the subtitle for each movement suggesting a distinct attribute or mood that we might see in ourselves. We have lift-off, not with a blaze of rockets, but with a fiercely resolute rhythm rumbling out of the darkness. Alongside growling timpani, a military feeling is conjured as Holst effectively turns the stringed instruments into drums themselves, directed to play col legno meaning they must beat out the rhythm using the wood of their bows against their strings. For forty bars non-stop, a thunderous tam-tam reverberates louder and louder. If it sounds like an infantry approaching, the sensation is apt: when Holst wrote this movement, World War One was looming. Both the names of the planets and their astrological personalities are drawn from Roman gods. Mars (God of War) was a paramour of Venus (Goddess of Love), so it makes sense that Holst pairs them here. After the first movement’s gloom, Holst generates instant radiance through spacious, lucent orchestration. Every instrument plays in its highest register, gilded by celeste and harp. While this charmingly suggests the brightest star in the sky, it’s in no way a snapshot of the planet itself which we now know to be mainly volcanic. Instead, Holst goes about creating a pastoral scene: a solo violin reminds us of The Lark Ascending which Vaughan Williams was writing at the same time. A minute in, listen out for the lazing flutes which ebb from one note to another: we’ll hear this later on our journey in a very different guise. Once more, it’s the planet’s Roman namesake (with his fleet feet and winged helmet) who comes to mind in this miniature rollercoaster. Bubbling woodwind streak skyward almost trying to catch up with the melody as it bounces back and forth like a free-runner from B flat to E major. Another character brought to mind is Peter Pan whose adventures were published just a few years before its composition. You can almost hear Tinkerbell too, keeping pace alongside in the shape of a tireless glockenspiel. In one breathtaking passage, Mercury’s role as messenger is evoked by a melody passed swiftly from solo violin to oboe to flute to celeste to clarinet then back to the violins. Rocketing strings and brassy blasts fittingly evoke the grandest planet in the solar system. But then something quite unexpected occurs: horns and trombones launch into a jaunty march which brings to mind the merry earthbound bustle of Elgar’s Pomp and Circumstance. Before long, another surprise arrives: the magisterial anthem that so many of us know today as I vow to thee, my country. The lyrics were in fact added some years later as Britain commemorated those lost in the Great War. Holst’s original intention was not to pen a hymn of national pride; instead, it seems this stately interlude was his way of expressing that jollity isn’t necessarily frivolous; that joy is as deep and deserved a feeling as any other. From here on, it feels like the suite has said farewell to its youth. The ebbing flute figure from Venus returns but drawn out far slower, like the pendulous tick of a grandfather clock. In what was apparently his favourite movement, Holst casts his eye upon mortality. A funeral procession begins with sombre brass advancing steadily towards an outburst of clanging bells. A tiny tone poem in itself, this is the only movement that takes us on a journey from one place to another: by the final refrain, the mordant pulse has vanished and we’re left with a sense of floating serenity, as if it’s not so terrible to grow old after all. The tranquillity is ruptured by an avalanche of brass but, as quickly as it came, this vanishes and we find ourselves in the unmistakable company of the cheeky bassoon from Dukas’ The Sorcerer’s Apprentice, a work still casting a spell on concert audiences when Holst wrote this piece. The exuberant mood then unravels into a rowdy march punctured with thunderous timpani and lightning flashes from the cymbals. It almost becomes as ferocious as Mars but a resiliently cheerful xylophone tags along for the ride, making us feel more like we’re watching a child playing at war, instead of witnessing the real thing. Finally we find ourselves at the outer limits of the solar system and, for the first time, Holst evokes the lonely, desolate atmosphere of space itself. Fittingly, any sense of a fixed tonal centre has been left behind. Amid the shimmering harp and celeste, something remarkable emerges that we haven’t heard till now: voices. How extraordinary to come this far from Earth and be confronted by this most human of sounds. Somehow, it perfectly crowns Holst’s conviction: that whatever we see out there in the universe is ultimately part of ourselves. Good news for aspiring composers: Holst was a humble music teacher who wrote this piece not to commission but in his spare time, before it made him an overnight sensation. Like Strauss, Holst was captivated by the spiritual concepts of his day: not just astrology, he also learned Sanskrit and avidly read the Indian epic Mahabharata for inspiration. What no Pluto? It was only discovered 13 years after The Planets was complete, by which time Holst had no urge to revisit the piece that now overshadowed all his other works. Time then looked kindly on him as Pluto later lost its planetary classification. Just as all space movies have their sequels, so additions have been made over time to Holst’s suite, as mankind learns more about what lurks out there in the dark. Though Pluto was discovered 13 years after The Planets was written, Holst had no urge to revisit the piece that by now overshadowed all his other works. Nonetheless, for the millennium, Colin Matthews was commissioned to boldly go where no composer had gone before. Matthews was an apt choice, having previously worked with Holst’s daughter Imogen editing the definitive version of her father’s masterpiece. At the time, he questioned the endeavour, joking that you’d have to take the orchestra itself offstage to depict anything beyond the offstage voices of Neptune.